It's not the best photo in the world and scanning it didn't make it much better, looks mostly like a bunch of grayish haze but there is a baby. 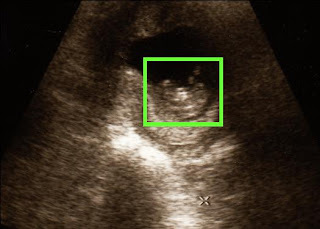 I highlighted him/her with the green box, to the left end is the head. Where the white in the center is where we could see the little heart beating. Not really visible in the scan but above that is where the little hands were moving. To the right end you can where it curves up and then little itty bitty feet (if they follow in big sister Jenna's footsteps they won't be little for long!) Makes it seems SO real!!! I know what you mean! It was so cool seeing that little heart beating. It makes everything so much more real! Jenna will be such a good big sister. I met her when I taught in Kidzone this past Sunday. What a sweetie! Technology is just so amazing. What fun! Hey Dave, Wendi and Jenna - CONGRATULATIONS!! We so excited for you! Hope you are feeling good!